WARNING: This post is REALLY picture heavy! I apologize for the radio silence the last number of weeks. I've been CRAZY busy in the kitchen! No lie, this past weekend was the first weekend that Joe and I didn't have some time of commitment to attend to, holiday related or otherwise. Other than a few errands, we basically hung around in our PJs all weekend and it was FABULOUS! I'm glad we were able to get that free time, because between my friend's wedding stuff and our own wedding stuff, I think things are about to get hectic for a little while. I've been wanting to work on improving my decorating skills, and I figured this holiday season was as good of a time for that as any other. 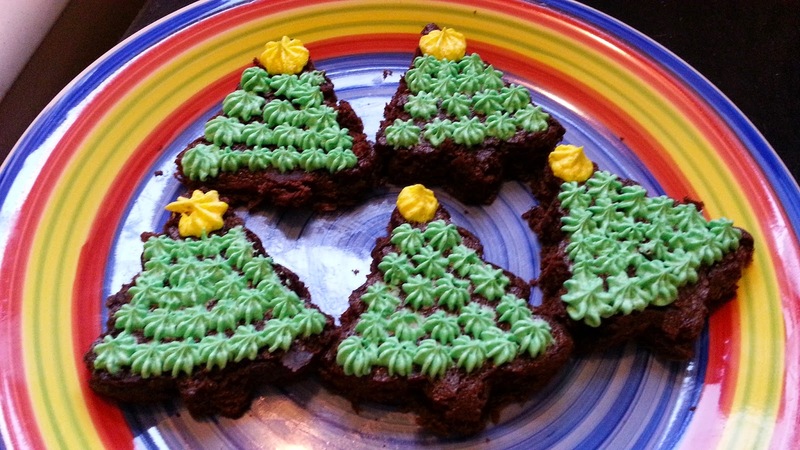 I didn't make too many new recipes; instead, I worked on making some of my current recipes reflective of the holiday season. To that end, there's really not much to blog about - I don't want to share the same recipe with you 47 different ways. Instead, I'll just share some pictures. There may be one or two things missing, but this is more or less everything I made between Thanksgiving and Christmas. 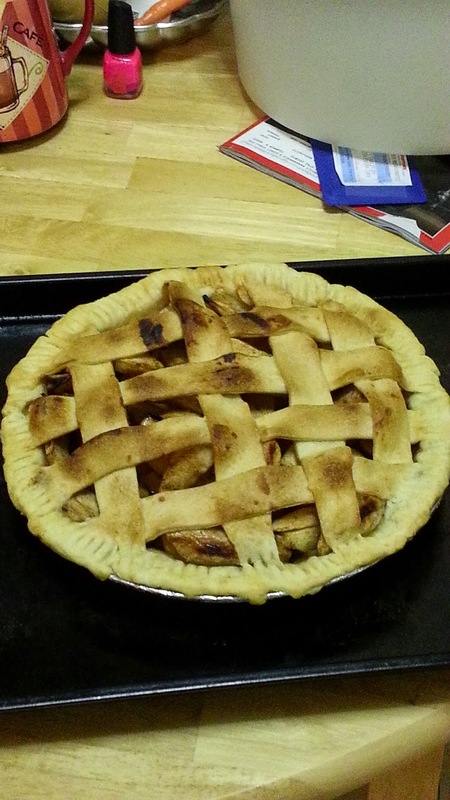 Thanksgiving isn't complete without pie, but I didn't want to do a regular ol' pie. Lattice top is WAY easier than it looks and my family was blown away. 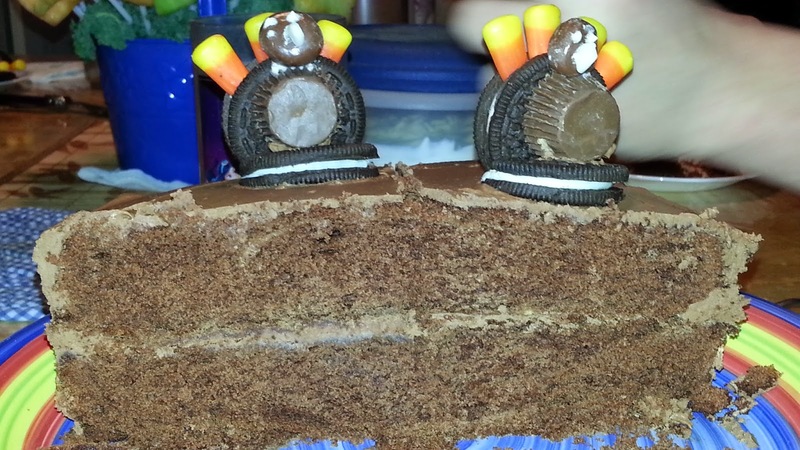 While on the phone discussing the Thanksgiving dessert menu with my mom one night, Joe walked into the room and loudly announced that he wanted "Turkey cake". The man didn't elaborate any further, so... 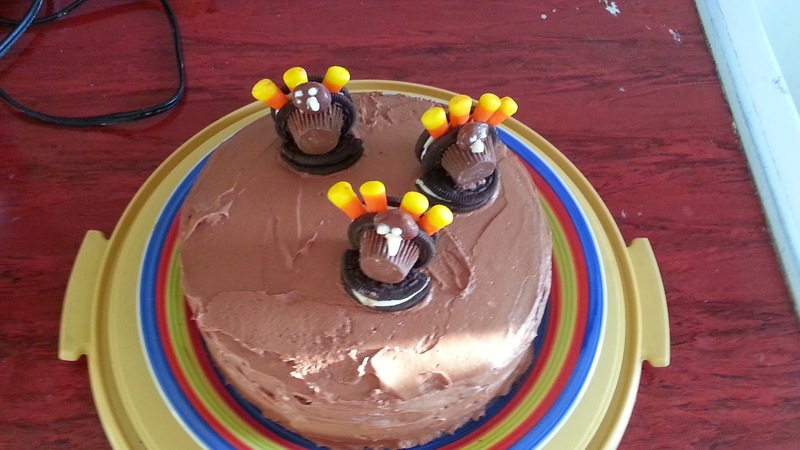 I made turkey cake! After Thanksgiving, my friend Sarah and her almost-husband Shawn had a party. Naturally, they asked/told/requested that I bring a dessert. That afternoon, I posted on FB that I had made an awesome thing and couldn't wait to show them. When we walked in, Sarah grabbed the pan out of my hands and uncovered it to see what I made. 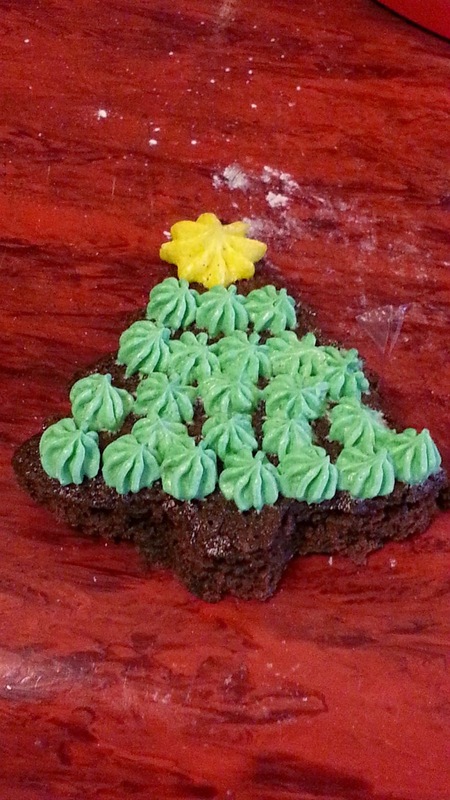 She promptly yelled for Shawn to get in the kitchen and take a look; he immediately summoned everyone else to behold my Christmas brownies. I also went to my best friend's house to hang out with her, her son, and their new baby while her husband was at work. 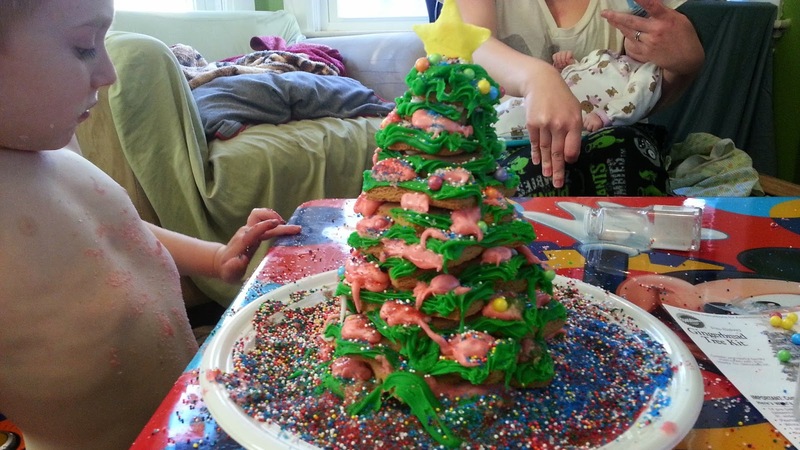 She had a few gingerbread kits and her toddler was bursting with excitement to make one with me. He picked the Christmas tree one and this is how it came out! In September (October? 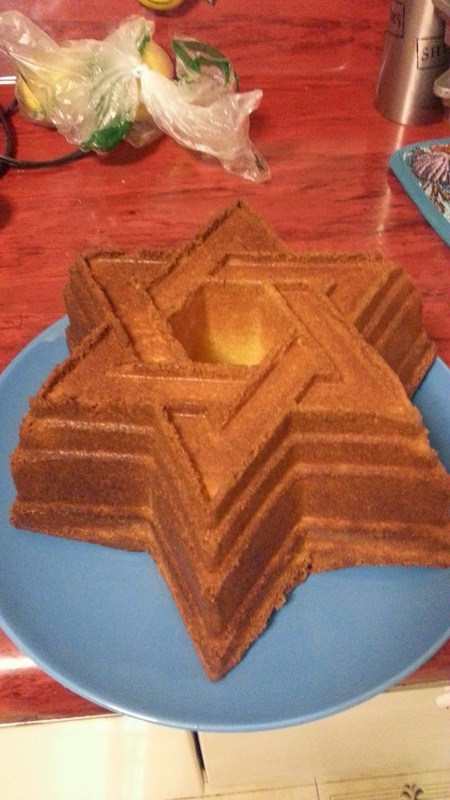 ), my mom gave me part of my Chanukah present really early: a Star of David bundt cake pan and a bunch of Jewish-themed chocolate molds. She said I "didn't have to" make any special desserts for Chanukah, but I am also smart enough to realize that she wouldn't have given it to me so early if she didn't think that would be a fantastic idea. We didn't really need that much food or desserts since it was just the 5 of us, but I wanted to use a little bit of everything that she'd given me. First up: white, dark and milk chocolate candies! The blue is also white chocolate. I was trying to play around with the stars to make them two tones and the one on the top right corner and the one just below it came out just as I had hoped! 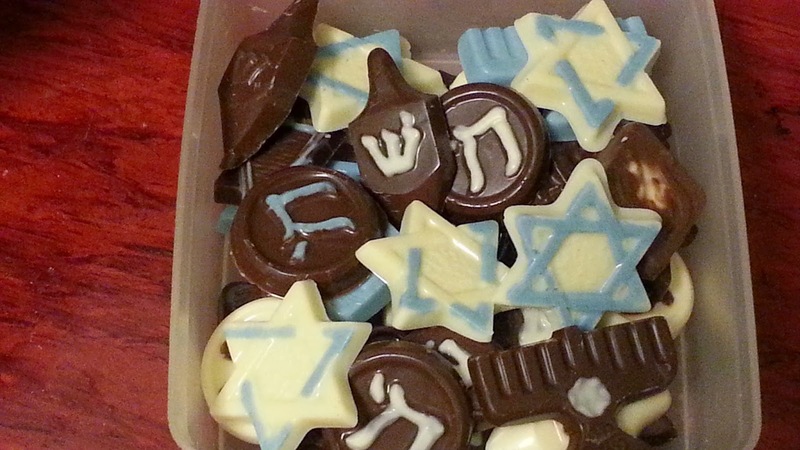 I also really like the way the dreidels and circle ones came out. One of the molds that my mom got was of the entire Jewish alphabet. 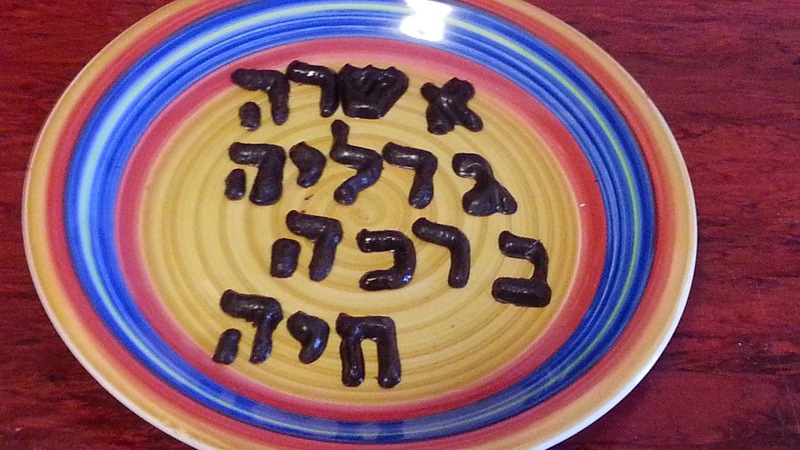 Never one content to just leave things as-is, I decided to spell everyone's Jewish name (well, minus Joe since my gentle Gentile doesn't have a Jewish name) in chocolate. A couple of the letters ended up breaking during transport when they got squished between the other candies, but everyone was digging through the little container to see if they could find their letters. This one was the hardest, if only because the molds only had one of each letter and I needed one letter a few times, as you can see below. Other than that, the molds were super fun and really easy to work with, though I do need to get some type of squeeze bottle to make the two-tone thing a little easier. Besides my mom's latkes, this one was definitely the superstar of our little Chanukah party. 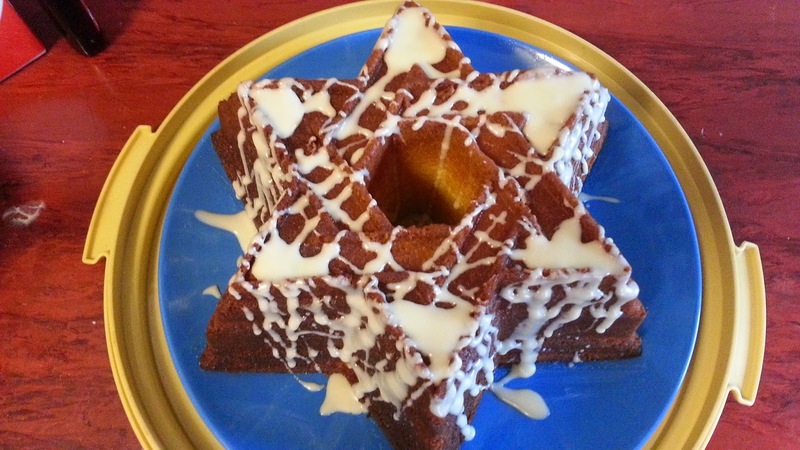 It's a lemon bundt cake with a vanilla drizzle icing. I was a little worried because I'd never made a bundt cake before (in fact, this was attempt #2 because the first one didn't cook all the way through) and I wasn't sure if this was going to be as light and fluffy as I had hoped. YOU GUYS. I'll probably end up doing a separate blog post about it, because everyone loved it. Joe loved it so much that he went out of his way to tell me how incredible it was.... and then he asked me to make it again and/or make it into cupcakes. 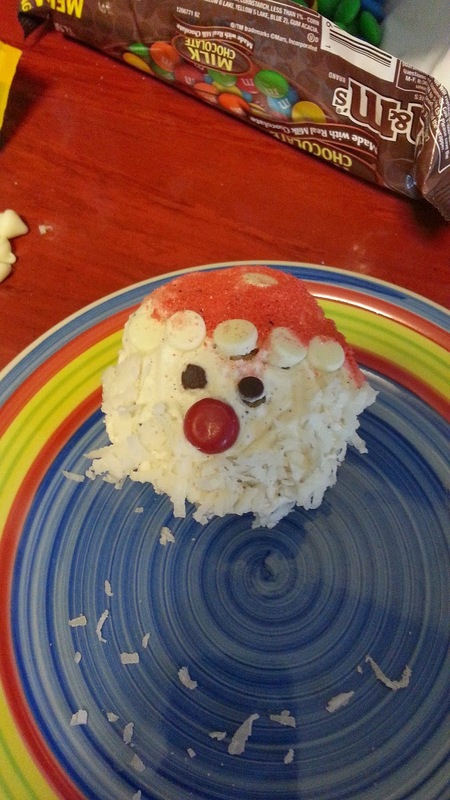 This year, we had multiple Christmas celebrations. On Christmas day, we went to Joe's dad's house for a little bit, then we went to his mom's for dinner and gifts. That Sunday, we went to his aunt's house for the big celebration with all of the extended family. 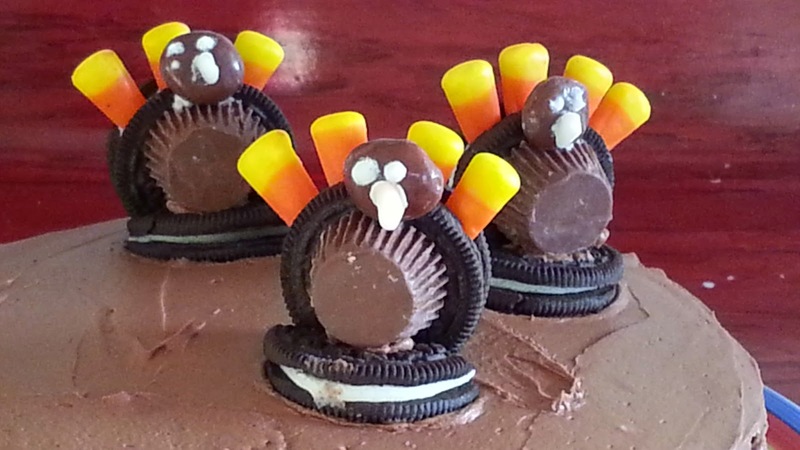 These family gatherings are usually a potluck event of sorts, where the host will make one or two of the main items and then ask for everyone else to bring a salad/side/dessert to make the complete meal. 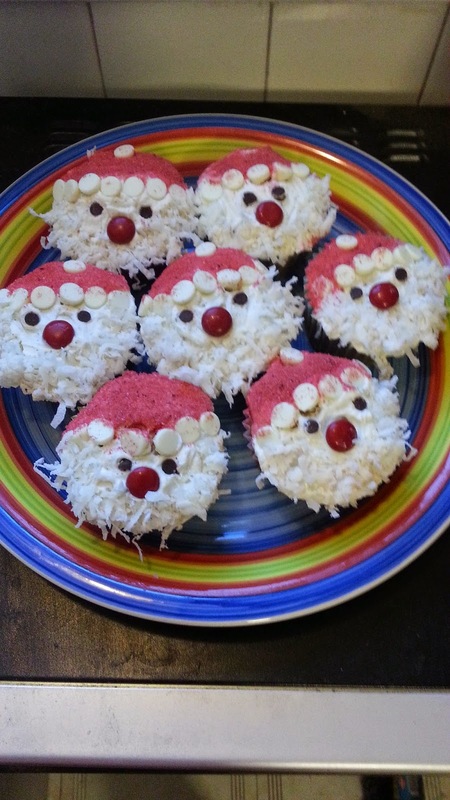 Naturally, I volunteered to make cupcakes. These were by far the most time consuming thing I made this holiday season. I mean, the chocolates were time consuming, but I was able to do other things while I had them chilling in the fridge or freezer. These were time full hands-on time consuming. I took a break of about 30 minutes halfway through, but decorating 2 dozen of these took me about 2 hours. Unfortunately, I couldn't find a way to streamline it any better. That said, seeing the look on the little kid's faces when they saw these? PRICELESS. Can you figure out everything that Santa's made out of? So - how did I do?